This unquie chocolate wooden box is created for our good customer of Lofoten Sjokolate. It is made from our natural local wood. It has silky smooth surface and very neat inside. Black or any other color edge decoration is available. The inside size of this chocolate gift wooden box is very strictly set up. After chocolate sit there, it is very steady as you handle it upside down. If you could put sleeve arround this box, it will be perfect to show more information of your chocolates. We, Extreme Enterprise is specializing in creating quality wooden chocolate gift boxes and wooden tea boxes and chests. We take great pride in offering your quality boxes to meet with your different demands. Quality to details and service to specialist is our aim for these years. 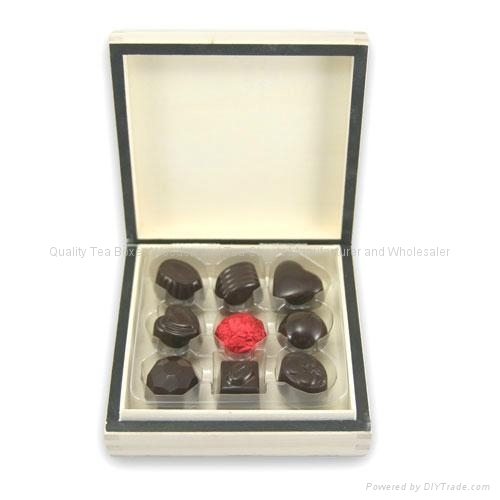 If you would like to find any chocolates wooden boxes and tea wooden boxes and chest supplier and manufacturer in China, you are here. Please contact us today to get more information about us!